Not strictly part of the ‘show’ (and certainly not a hand-built bike) but one highlight was the chance to wander around in the underbelly of the Velodrome and emerge up the ramped access into the middle of the track where the majority of the displays were located. I have tootled around the 30º banks of Herne Hill a couple of times on a road bike before but the vicious 42º rakes here look even steeper from the vantage point that the riders get to enjoy whilst nervously awaiting their event. There were track lessons going on when I visited on the Friday evening and having skin-suited riders clip-clopping around the corridors and flying around the pine boards whilst I got to look at some of the most gorgeous bikes in the country, provided the perfect backdrop and an atmosphere that would be impossible to achieve at any normal trade show venue. I got all the way to the back of the infield in my first sweep of the stands and was quickly in danger of suffering from bike overload. Luckily I was slowed by the first thing that really caught my eye: Wittson’s gorgeous Titanium Suppressio frameset. With it’s beautifully engineered in-built seatpost, it really stood out. Wittson are a Lithuanian company who have a long history of making titanium bikes for Colnago and other companies but who are now offering their own custom builds direct to the market. Vitas Zukauskas, who started building frames in the 1990’s after careers as a pro cyclist and coach, was on hand to offer me some delicious Lithuanian waffle as I spoke to his son Mindaugas, who is heading up the return to one-off custom builds. Wittson will make a custom frameset for around £1,700 and deliver it within 30 working days, which judging by other costs and timescales being spoken of at the show is not a bad deal. It’s not all that easy to try out a bike at Bespoked. Apart from the fact that you get the sense that the paintwork may not yet be quite dry on more than a few of the steeds on show, there is the other issue that they are often ‘someone else’s bike’ and just back on loan to the builder for the show. I did manage to get a whizz round on something though, courtesy of the folks at Loopwheels. I’ve been to a couple of shows now where I’ve seen something in the flesh that had been doing the rounds on Kickstarter some months earlier and Loopwheels is one of those. It’s heartening to see that products are finding the funding to take them to development level and are now out there, in the real world, promoting their ideas. The Loopwheel company are just a year old and is the brainchild of designer/owner Sam Pearce. It’s a really simple concept: suspension forks only work in one direction so why not integrate suspension into the ‘spokes’ of the wheels so they work at all angles. This ‘tangential suspension’ produces a smoother ride and minimises road buzz. Currently only available in 20″ and suitable for Dahon bikes, they look great and will be really popular if Loopwheels can get the pricing right and work closely with manufacturers to get them included at point of sale. I took a Loopwheeled Dahon for a spin around the stands and, even on the smooth surface of the Velodrome infield, could feel the suspension working really well. It would be great to be able to try them out in the real world for a while and I’ll be badgering Loopwheels for a test rig to try. One of the bikes on the Oak Cycles stand produced a comedy double-take and mid-sentence stumble from me as I went past. I have followed the protracted story of this particular bike’s birth on a cycling forum for many, many months and unexpectedly seeing it in the flesh was quite a shock. 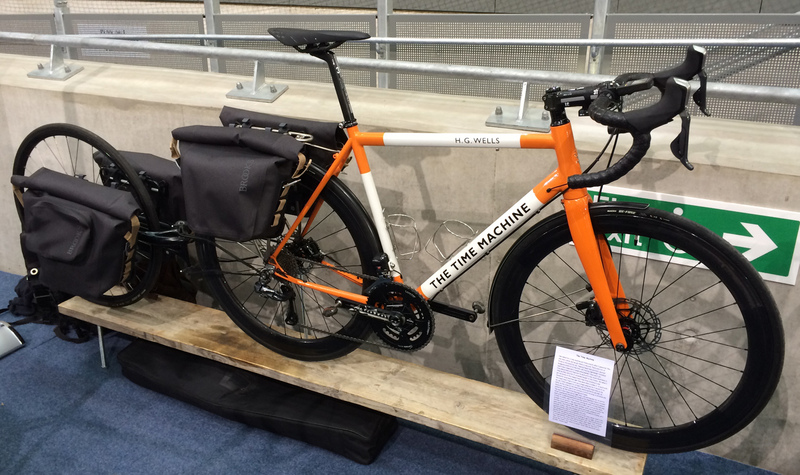 ‘The Time Machine’, a lightweight Di2 equipped mountain goat that can double up as trailer-hauling tourer and all-weather rouleur, had been in perfectionist builder Ryan McCaig’s workshop (which is the proverbial stone’s throw from the velodrome) for so long that the name – actually derived from the Penguin Classic book cover colour schemes which the owner has a penchant for – was beginning to become self-prophecising. It has to be said that the outcome was worth the wait though as the bike is quite stunning and exactly what the customer had wanted at the outset. Ryan, a very tall American who has found his home in East London, spoke earnestly about the build, reminding us that a hand-built custom build is just that. Built by hand, utterly unique and as well as being a labour of love and skill, each one is journey of discovery and adventure for the frame-builder. There were many excellent paint-jobs at the show but the two which stood out for me were a quiet Pegoretti on the Mosquito stand and a super loud frame over at Festka. The Pegoretti was deliberately Lo-Fi with simple finger and palm prints occasionally decorating the frame around a logo that had been hand-stamped like a potato print. The imperfections in the paint were what really brought this one to life for me. In contrast the Festka was a highly finished composition of bold, bright patterning that screamed for attention and got it in bucket-loads. Both approaches worked brilliantly. There were quite a few frame-builders over from Oregon this year and I spent a bit of time talking with Joseph Ahearne, who was displaying a mirror-polished stainless touring bike complete with eating-fork headbadge and a hip-flask located at the bottom of the down tube. Even at somewhere north of $21,000 it wasn’t the priciest bike at Bespoked (the gold-plated bamboo bike over at Veloboo took that accolade I think) but I was impressed that Joe had ridden it out to Epping Forest a couple of days before and somehow still managed to get it back to concourse condition in time for the show. Some of the bikes on show felt like art pieces but I think that bikes should always built to be ridden and Ahearne showed that, so long as you are prepared to spend a lot of time with the cleaning cloth, you can have the best of both worlds. UPDATE – this bike is in LookMumNoHands on Old Street at the moment – Go and see it! My favourite frame at the show was a Cherubim ULI from Japanese builder Shin-Ichi Konno Cycle Works on the Kinoko Cycles stand. Everything about it, from the rich metallic mid-blue paint, the elegant lines and the retro decals, was simply perfect. A real head-turner these ones. Sat on a few straw bales in the middle of the show were three densely black frames that initially appeared to be a rough grade iron which looked as if they had just come out of a medieval blacksmiths forge. A closer inspection revealed that they were hand-built, ‘Single Piece Technology’ carbon fibre, all made in a kitchen in Hackney by Ed Vavilovas. Tsubasa means ‘wing’ in Japanese and the frames are monolithic structures, built up as jointless entities, which Ed claims is a unique concept. There is an equally deep intellectual process bound into the frames that runs through the photocopied A4 sheet that serves as Tsubasa’s brochure. Not everyone’s cup of tea no doubt but a very refreshing approach. There is something hugely exciting about asking how many frames a company have made and hearing the answer “Just these two.” Brighton based Nerve Cycles, who brought two very good-looking custom bikes (one stainless steel and one carbon fibre) to the show, are so new that they don’t even have a website yet. Calling on F1 expertise for the carbon and master frame builder Mark Reilly’s experience for the steel, the showbikes looked to be well balanced and very finely finished. We’ll be following up on their progress with interest. Being surrounded by all this hand-built goodness inevitably leads the visitor to think about trying the much-mystified art themselves. I was no different and soon found myself lingering at the Downland Cycles Frame-Building Course stand in the very centre of the show. They had thought through their sales pitch perfectly by having people who had done the course acting as their reps and I got chatting to a German guy who had recently done their short course with his dad. “And this is the bike I learnt to build” he said, pointing at an elegant frame that had both lugged and fillet-brazed joints and which didn’t look too far out of place amongst the cream of the UK handbuilder’s work. Based near Canterbury in Kent, Downland offer courses of various length for all levels and have board and lodgings options available so all you have to think about is your angles and keeping your welding arm steady. It’s on my wish list for sure.. Even the quickest of looks through the studio shots taken by Bespoked’s photographer, Ben Broomfield, showed me how much I missed in the three hours that I had for my visit. The photos are well worth checking out as they capture the great range of bike types and styles that were on show and pick out loads of the amazing details that have been lovingly and ingeniously incorporated into them. The buzz of the show and the chance to meet and talk with the people who build the bikes is fantastic but you do sometimes need to take the bikes out of the melee and place them against a neutral background to really appreciate them. It must have been really hard for the judges to make their decisions. And with that Phil, a talented custom frame-maker in his own right, headed back to his Simple Cycles workshop, which one feels he may have been missing a bit in the run-up to the event. For anyone remotely interested in the craft, technology, beauty or breath of bicycles, a visit to next year’s show is a must. Bespoked have produced a short film about the event which interviews some of the exhibitors, including Joseph Ahearne from my piece above, and also shows the award winners. Bespoked – The UK Handmade Bicycle Show 2014 – Lee Valley Velodrome, London from Bespoked on Vimeo. This entry was posted in Uncategorized and tagged ahearne, bespoke, bespoked, chrubim, Cycling, downland, engineered, festka, frame, frame-building, handbuilt, islabikes, kinoko, loopwheel, nerve, oak cycles, pegoretti, tsubasa, velodrome, wittson. Bookmark the permalink.